The heat from a dryer is just as effective at removing wrinkles from denim as an iron. Jeans are put to the test more than most other wardrobe staples. Their versatility makes them a go-to item for daily wear, and with that comes obligatory washing. Jeans wrinkle easily once wet, and ironing is not always convenient when you want to quickly put them back into your outfit rotation. The easiest way to remove wrinkles from jeans is to use a clothes dryer. 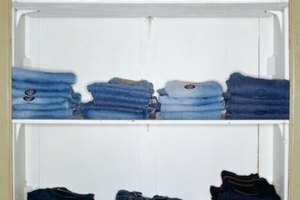 Place the jeans into an empty clothing dryer. Soak a hand towel in cold water and gently wring it out. Set the towel in the dryer with the jeans. Adjust the dryer to the highest heat and “wrinkle rid” setting if available. Turn the dryer on and allow it to run for 10 minutes. Remove the jeans from the dryer and shake them out immediately. Hang the jeans over a curtain or shower rod to cool.